Fourth Row Center: Film Writings by Jason Bailey: On DVD: "The Fantastic Mr. Fox"
Anderson’s last film, The Darjeeling Limited, was a pleasurable enough diversion, and light as a feather—which was part of its problem. I’d already forgotten it about twenty minutes after leaving the theater. He hasn’t made a bad film yet, but in spite of its exotic locales, Darjeeling felt like the work of a filmmaker trapped in a box, working the same themes and painting on the same palate, and risking typecasting himself (and exclusively serving a steadily dwindling niche audience). 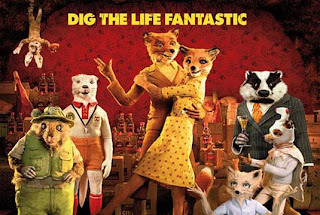 Fantastic Mr. Fox is not, to reiterate, that far removed from his wheelhouse, but by turning his filmmaking process upside-down, Anderson seems to have reconnected with the infectious energy and all-out joy of his early pictures. Fantastic Mr. Fox has its flaws; it might be too twee for some tastes, and the second half gets a little stuck in the mechanisms of the plot (it’s not quite as funky and free-wheeling as the set-up sequences). But it’s an absolute charmer, sweet and sunny and unquestionably entertaining—though I wonder what it says about mainstream American filmmaking that the three of the best pictures of last year (Up, Where the Wild Things Are, and this) are ostensibly made for kids. "The Fantastic Mr. Fox" hits DVD and Blu-ray today.